More halloween fun. Parker is gir from Invader Zim. 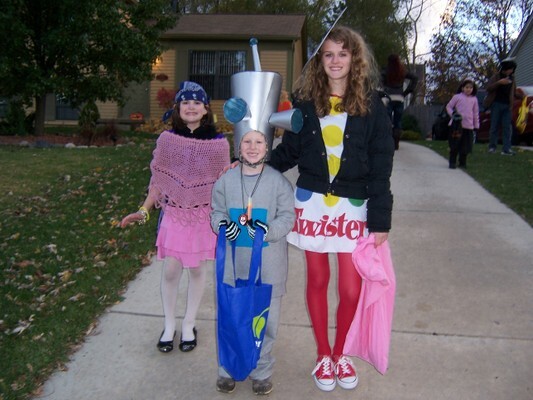 Paulina is in a Twister dress, Eden is Toph from avatar and also is a gypsy. Deann is medusa (look closely for snakes in her hair. Brian is a statue, because ... well ... you know. Although we've always known, I don't think we actually new. Nike bases (we had one right next door, literally, site D-87) were launch sites for short range tactical nuclear missiles. As a defense option against incoming ICBMs, they were strategically placed in a perimiter pattern around major cities (e.g. Detroit). Check it out: Commerce/Union Lake base. You may need to scroll down a bit. I was tipped off in an odd sort of way while watching a discovery channel episode about a base in New York, the terms NIKE and base weren't used together, but 1 + 1 = 2. More info: www.nikemissile.org and NIKE Hercules. 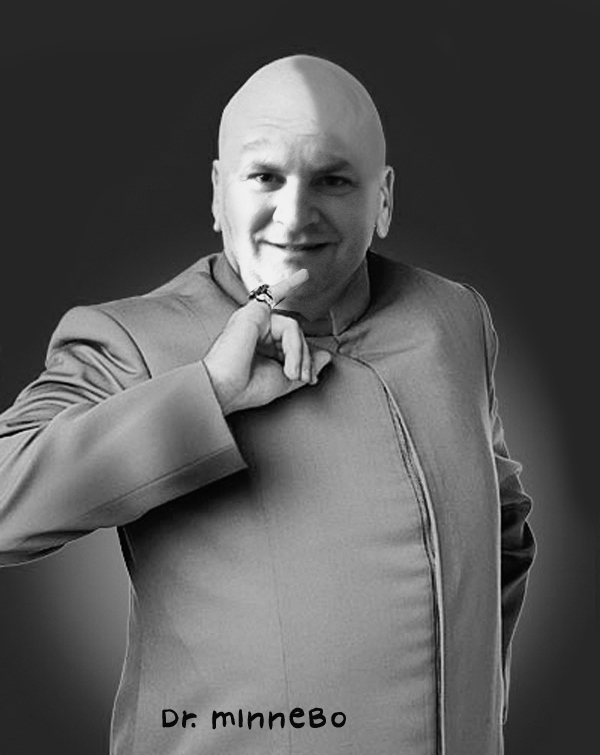 If I were an evil genius ... Dr. Minnebo. Apr. 19 2005 Parker Erupts! The game. Paulina publishes Parker Erupts the game. More PJ pics are up from around Christmas time 03. Plus, are they real, or are they memorex? Reception with the artist on January 28, 6:30-7:30 p.m.
A long awaited welcome to the youngest member of the Minnebo Family, Parker James Minnebo (PJ ?) he was born at 2:04 am on November 18 2003, coming in/out at 7lbs 8oz. Congrats Deann, we knew you could prove the psychic wrong. Gramps says the check is on its way. Pumpkins are carved. Eden's demonstrated a remarkable ability with abstract design. Pics of the Halloween Decoratons are up. Qui-Gon Jin's corrected Lego Minifig. Dinosaurs attack! Well, one did, anyway. Some pics are up of my trains. Just set up a movie stuff page, nothing fancy, just comments and links. I survived the Big Blackout! (and all my webmaster gave me was this lame blog entry) Oh yeah, he finally got around to fixing the broken links left over from the great crash of '02. Paulina learns to ride her bike, A neighbor learns to not park in the street. Looks like we are back online, sort of. A few of Eddie's 95th birthday pics are up. It is with sorrow that I announce this. On friday August 30, 2002, Edward Minnebo (born August, 1907) passed away at the age of 95 years. Good luck Eddie on the journey ahead. Minnebo.net is founded on June 2, 2000 as a place for the Minnebo family and friends to have their net presence.